Many of you requested to see a ‘buying guide’ with prices and product details prior to the collection launching. Well, here you go! As a reminder, the collection will be live at 9am EST on 10/22 at Nordstrom.com and in select Nordstrom stores – you can read more details about the collection here. Today, I am kicking things off with the accessories buying guide, and tomorrow will follow up with apparel and footwear. Also, excited for next week as I will be in L.A. on Wednesday 10/24 from 5:30-7pm at the Nordstrom Local Melrose. There will be sips and snacks to celebrate the launch and I will be there to meet all of you, chat about the collection, and help with styling. If you are in the L.A. area, I hope to see you there! 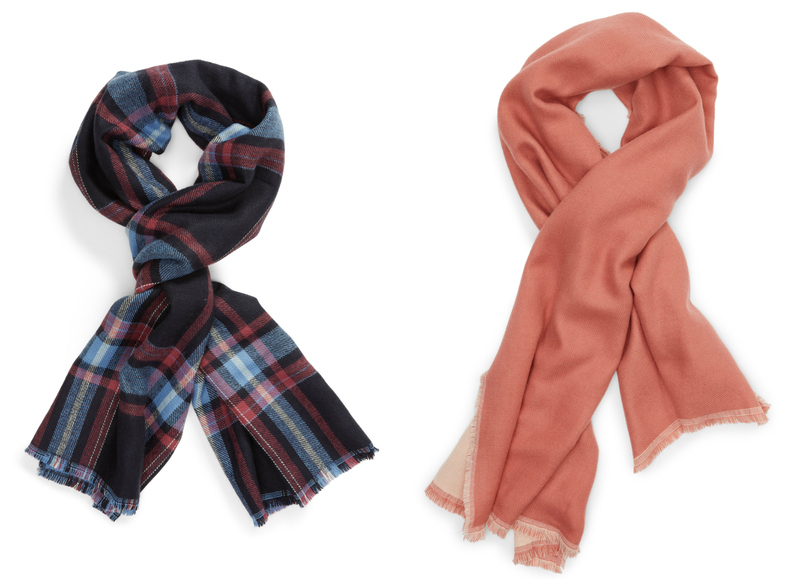 THE REVERSIBLE SCARF // $45 (pink) $49 (plaid) // This style is oversized, incredible cozy, and pairs perfectly back to all of the outerwear in the collection. This piece is available in a double-sided blue and light blue plaid option, and a pale pink and blush solid option. 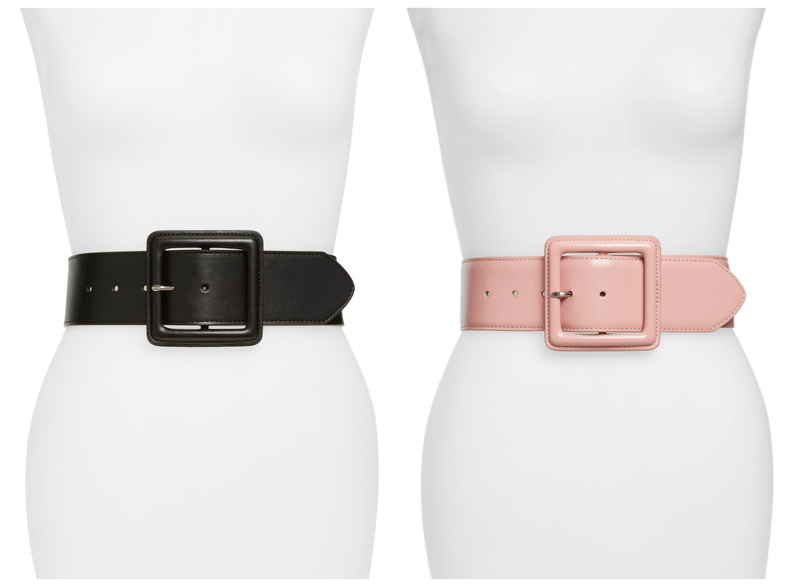 THE WIDE BELT // $39 // Belts are back! This season I have been belting EVERYTHING and this style is a closet all-star in the making. This wider belt with a square buckle features an elasticized band on the back giving it the ability to stretch and be re-sized to wear over or under your favorite items. Lately, one of my moves has been belting my bulky outerwear to create a new streamlined silhouette. 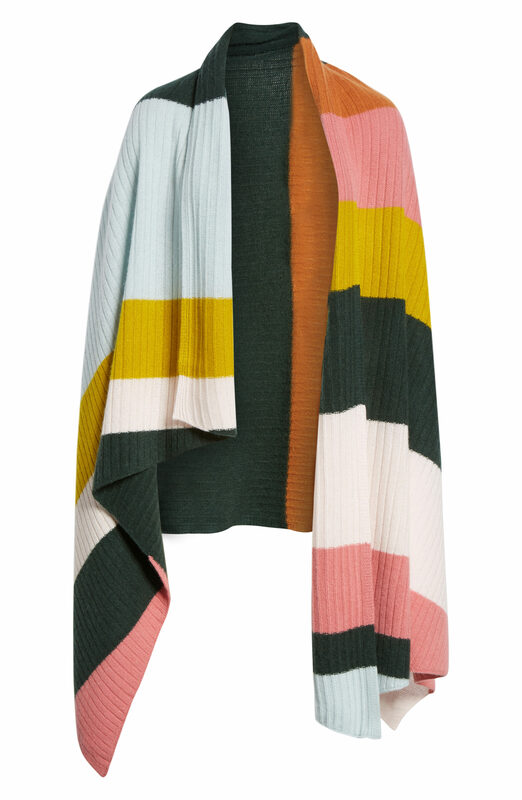 THE COLOR-BLOCKED CASHMERE SCARF // $199 // Under $200 for an oversized 100% cashmere scarf is a total steal. It’s also a true investment piece you can hang onto season after season. The color combination is one of my favorites in the collection and is surprisingly versatile. As seen above, I love how the colors look back to a rich tan, and the angled cut of the scarf provides a beautiful drape that isn’t always achievable with other oversized scarves. This scarf has become my new travel companion and makes for a truly incredible gift. THE CASHMERE BEANIE // $55 // Another 100% cashmere style (minus the faux fur pom) within the collection! This chunky piece is just so comfy-cozy. 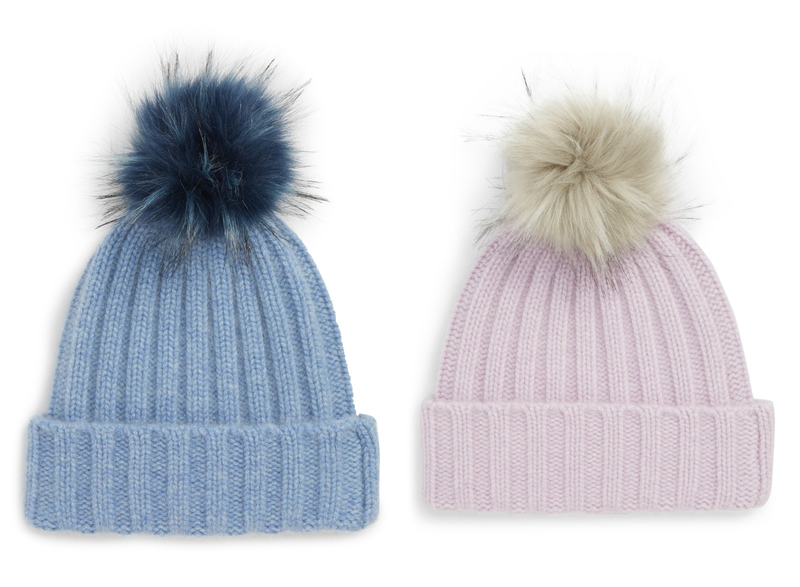 We decided to create this beanie in these two super feminine colors to match back to nearly everything. I am so excited to wear them all season long! 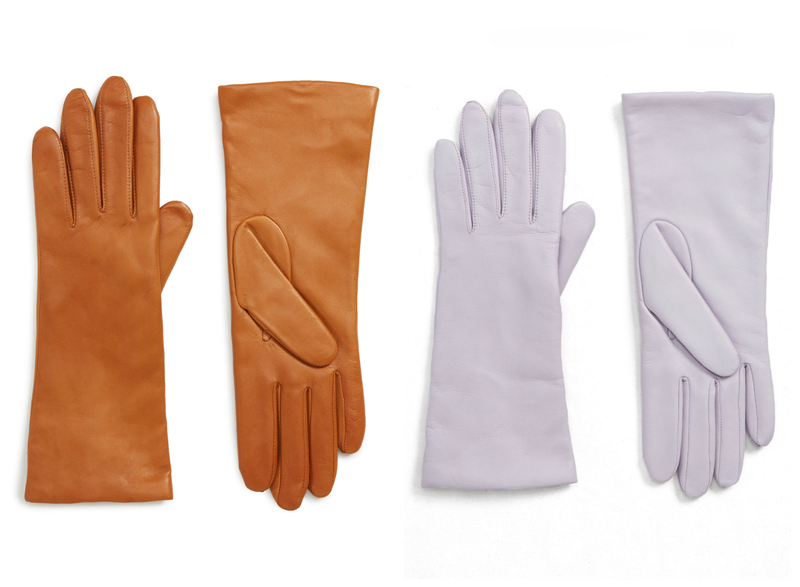 THE LEATHER CASHMERE LINED GLOVES // $99 // Come cooler temperatures, I am never not wearing gloves. I love how classic this style feels, and we added just a touch of trend with a lavender color offering. These gloves are slim enough to fold over once and keep neatly inside nearly any small bag. Did I mention these are cashmere lined? FAUX FUR COLOR-BLOCKED WRAP // $89 // A glamorous and functional alternative to the blanket scarf, these faux fur stoles are incredible. 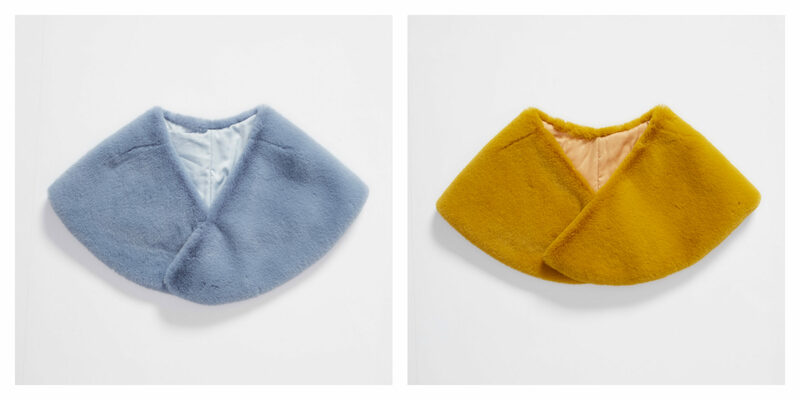 The faux fur fabric is the softest of its kind that I have ever felt, and the color combinations we created match perfectly back to so many of the apparel items in the collection. 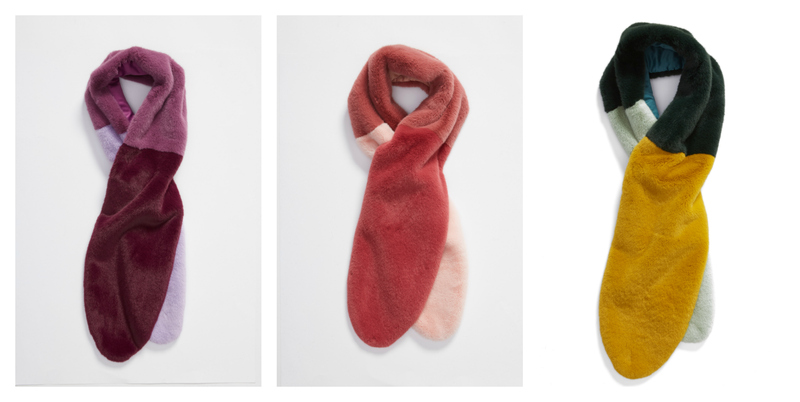 A new alternative to a typical scarf! This style features an easy hidden slit and you can slide one end through the other and wear it securely. FAUX FUR STOLE // $49 // A simple way to add a bit of warmth to a dressy outfit on a night out, or a modern way to make an old coat feel new. Simply throw one of these pieces over your shoulders to create a brand new look! This style has a great front hook and eye closure – so you can simply throw it on or secure it to fit snug around your neck. 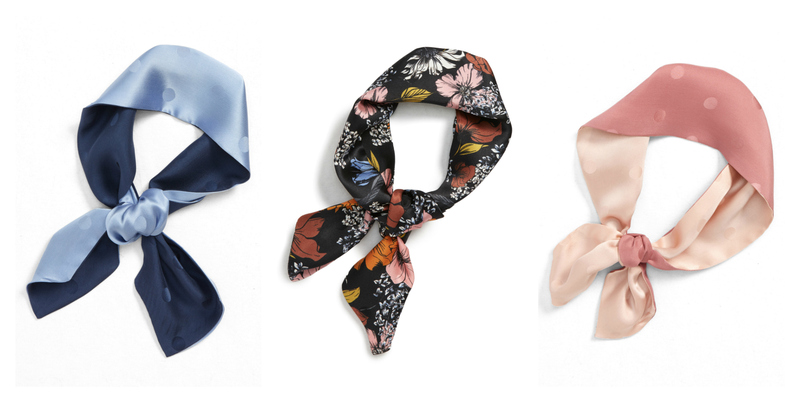 THE SKINNY SILK SCARF // $49 // These adorable scarves are 100% silk and add the perfect hit of color or print to your bag, your ponytail, or around your neck! 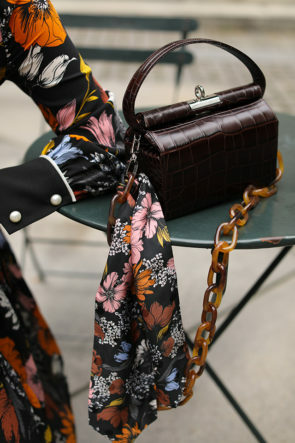 We designed the floral print to be paired back to BOTH black and brown, and it has been adorning a different bag in my closet nearly every other day. The beautiful blue and pink combinations are polka dot jacquard, a sweet and subtle detail that I love! COLORED TIGHTS // $15 // I have said it again and again – colored tights are the coolest, easiest, and cheapest way to transform a look. We have four incredible shades in the collection that I have been wearing ever since the temps have dipped. While I am a bit more daring and will wear these with a mini skirt and boots, they are also great to throw under cropped denim or pants for extra warmth – and to add just a *touch* of color! Not feeling for tights? 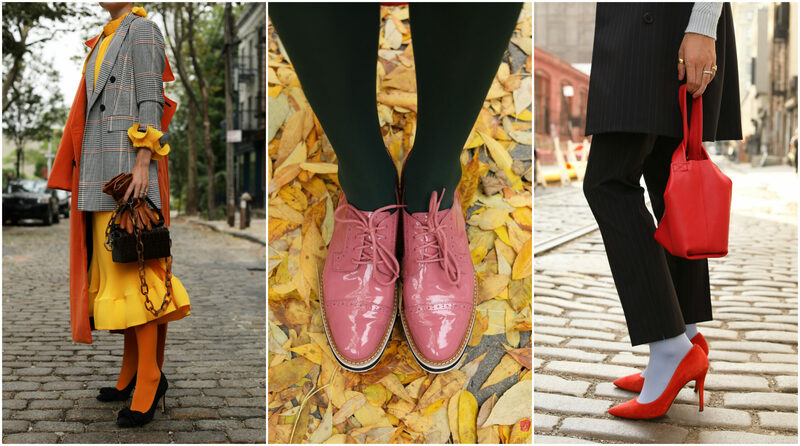 We also have lurex ankle socks – available in pink, blue, and orange – for just $10 – perfect back to the flatform oxfords or bow pumps in the collection! BERETS // $39 (black pearl) $49 (cashmere cable) // Berets were a huge trend last season and I wanted to take them in a different direction by adding texture to the knit and featuring pearl detailing on a solid black. The pink and ivory cable berets are 100% cashmere while the black is a wool blend. Expect to see the pearl beanie quite a bit around here in future posts on Atlantic-Pacific ;). Ohhhh all the cute pieces …. I really love ♥️ them all. Such a great collection to launch. The pink belt is gorgeous! The list of stores that will carry your line does not include the Nordstrom on Melrose. Will this location have it? Also, will the selection be the same in all stores that will carry your line? Thanks for sharing! Cannot wait to do some shopping! Thank you for the guide! I will definitely shop the berets and the tights. Only 2 more days- this is so exciting! In loveee with those big belts! So excited about this launch!!! The price points are great too!! Thanks for a fun, colorful, sophisticated collection Blair!! Loving all the faux fur scarves and the silk ones too! Love everything! Does the wife belt also come in brown? Thank you for sharing this buying guide. These are all lovely pieces. Hi Blaire, I have a question, I was about to buy the Polka Dot Tulle Maxi Skirt, and I did tried to choose the size, and it only appeared Large-Only size!!! Im 5’6 and 130!! I usually wear size small, I’m confused about the option sizing on this piece !!! Seriously… what an amazing collection! It really shows that you took a lot of time on it and it’s amazing that you got to partner with Halogen. My favorite piece is the metal button skirt! Nice sweatshirts , winter styles and head wears are available as above. check it out for logo embroidered beanies for this lovely winter.